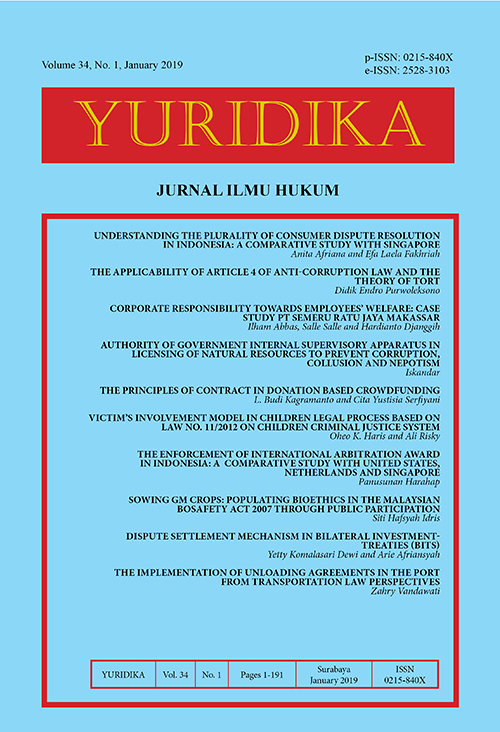 Yuridika P-ISSN (0215-840X) and E-ISSN (2528-3103) is an open-access-peer-reviewed law journal affiliated to Universitas Airlangga Faculty of Law and published by Universitas Airlangga, in printed version, firstly in 1976. The aims of the journal is to be a medium for legal scholars and practitioners to contribute their ideas resulted from legal research as well as conceptual articles to be disseminated publicly for Indonesian legal development. It is published three times a year in January, May and December. The scope of the articles ranging within legal issues in the field of constitutional law, administrative law, criminal law, private law, international law, regulation, comparative law, and jurisprudence. Some authors are prominent legal scholars from many well- known faculty of law i.e. Peter Machmud Marzuki, Philipus M. Hadjon, Bernard Arief Sidharta, Phillip Griffith, Ten Berge, Jan Michiel Otto and many others. Yuridika receives articles in English. Yuridika has been accredited by the Ministry of Research, Technology, and Higher Education of Indonesia since 4 December 2017 based on the Decree Number 48a/E/KPT/2017. Yuridika is an open access journal, all its articles are freely available online. In order to cover editorial process, web hosting, online tools, and indexing services we will charge a reasonable publication fee to the corresponding author. We will send an invoice once your article accepted by the Editorial Board. The payment must be made within the period stated in the invoice. The article will not be published until the payment is made. The Editorial Board may waive the publication fees upon request of the authors. The Editorial Board will consider such a request on an individual basis. If you need a waiver on publication fees, please state the reasons and send your request to the Editorial Board. After being accredited, the Yuridika Journal is committed to continuously improving quality as an International Journal. Therefore Yuridika has asked for willingness from Yuridika's foreign partners as the International Editorial Board.